2 Describe a proper diet, and list the basic food groups. 3 Explain why your body needs exercise. 4 Record the hours you sleep, and tell why you need rest. 5 Explain why you need fresh air and sunlight. 6 Explain why water is important for your body. List the number of glasses of water you should drink each day. 7 Describe and illustrate good dental hygiene. 8 Name three things that may harm your health. 20 you were bought at a price. Therefore honor God with your body. Describe a proper diet, and list the basic food groups. The U.S. Department of Agriculture (USDA) changed the Pyramid in 2005 because they wanted to do a better job of telling Americans how to be healthy. The agency later released a special version for kids. Notice the hiker climbing up the side? That's a way of showing kids how important it is to exercise and be active every day. In other words, play a lot! The steps are also a way of saying that you can make changes little by little to be healthier. One step at a time, get it? Eat a variety of foods. A balanced diet is one that includes all the food groups. In other words, have foods from every color, every day. Eat less of some foods, and more of others. You can see that the bands for meat and protein (purple) and oils (yellow) are skinnier than the others. That's because you need less of those kinds of foods than you do of fruits, vegetables, grains, and dairy foods. You also can see the bands start out wider and get thinner as they approach the top. That's designed to show you that not all foods are created equal, even within a healthy food group like fruit. For instance, apple pie would be in that thin part of the fruit band because it has a lot of added sugar and fat. A whole apple — crunch! — would be down in the wide part because you can eat more of those within a healthy diet. Make it personal. Through the USDA's MyPyramid website, people can get personalized recommendations about the mix of foods they need to eat and how much they should be eating. There is a kids' version of the website available too. Explain why your body needs exercise. When you exercise, you're helping build a strong body that will be able to move around and do all the stuff you need it to do. Try to be active every day and your body will thank you later! You may know that your heart is a muscle. It works hard, pumping blood every day of your life. You can help this important muscle get stronger by doing aerobic (say: air-o-bik) exercise. Aerobic means "with air," so aerobic exercise is a kind of activity that requires oxygen. When you breathe, you take in oxygen, and, if you're doing aerobic exercise, you may notice you're breathing faster than normal. Aerobic activity can get your heart pumping, make you sweaty, and quicken your breathing. When you give your heart this kind of workout on a regular basis, your heart will get even better at its main job — delivering oxygen (in the form of oxygen-carrying blood cells) to all parts of your body. So you want to do some aerobic exercise right now? Try swimming, basketball, ice or roller hockey, jogging (or walking quickly), inline skating, soccer, cross-country skiing, biking, or rowing. And don't forget that skipping, jumping rope, and playing hopscotch are aerobic activities, too! Can you touch your toes easily without yelling ouch? Most kids are pretty flexible, which means that they can bend and stretch their bodies without much trouble. This kind of exercise often feels really good, like when you take a big stretch in the morning after waking up. Being flexible is having "full range of motion," which means you can move your arms and legs freely without feeling tightness or pain. Food gives your body fuel in the form of calories, which are a kind of energy. Your body needs a certain amount of calories every day just to function, breathe, walk around, and do all the basic stuff. But if you're active, your body needs an extra measure of calories or energy. If you're not very active, your body won't need as many calories. Whatever your calorie need is, if you eat enough to meet that need, your body weight will stay about the same. If you eat more calories than your body needs, it may be stored as excess fat. It feels good to have a strong, flexible body that can do all the activities you enjoy — like running, jumping, and playing with your friends. It's also fun to be good at something, like scoring a basket, hitting a home run, or perfecting a dive. Record the hours you sleep, and tell why you need rest. The average kid has a busy day. There's school, taking care of your pets, running around with friends, going to sports practice or other activities, and doing your homework. Phew! It's tiring just writing it all down. By the end of the day, your body needs a break. Sleep allows your body to rest for the next day. Everything that's alive needs sleep to survive. Even your dog or cat curls up for naps. Animals sleep for the same reason you do - to give your body a tiny vacation. When your body doesn't have enough hours to rest, you may feel tired or cranky, or you may be unable to think clearly. You might have a hard time following directions, or you might have an argument with a friend over something really stupid. A school assignment that's normally easy may feel impossible, or you may feel clumsy playing your favorite sport or instrument. •Try to go to bed at the same time every night; this helps your body get into a routine. •Follow a bedtime routine that is calming, such as taking a warm bath or reading. •Limit foods and drinks that contain caffeine. These include some sodas and other drinks, like ice tea. •Don't have a TV in your room. 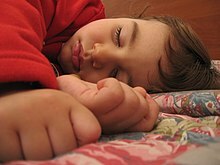 Research shows that kids who have one in their rooms sleep less. If you have a TV, turn it off when it's time to sleep. •Don't watch scary TV shows or movies close to bedtime because these can sometimes make it hard to fall asleep. •Don't exercise just before going to bed. Do exercise earlier in the day - it helps a person sleep better. •Use your bed just for sleeping - not doing homework, reading, playing games, or talking on the phone. That way, you'll train your body to associate your bed with sleep. Explain why you need fresh air and sunlight. Without fresh air you cannot live. Breathe deeply and enjoy! Sunlight contains vitamin D, which helps to form strong bones. Sunlight is a disinfectant. Exercise in the sunlight as in the “Russian Hop.” Get into a squat position with your arms folded across your chest. Hop up and forward with both your feet. At the end of each hop, you are back in the starting position. Hop around in a circle. Explain why water is important for your body. List the number of glasses of water you should drink each day. Since water is so important, you might wonder if you're drinking enough. There is no magic amount of water that kids need to drink every day. Usually, kids like to drink something with meals and should definitely drink when they are thirsty. But when it's warm out or you're exercising, you'll need more. Be sure to drink some extra water when you're out in warm weather, especially while playing sports or exercising. If you're going to be going outside, it's a good idea to drink water before, during, and after you play, especially if it's hot. You can help your body by drinking when you're thirsty and drinking extra water when it's warm out. Your body will be able to do all of its wonderful, waterful jobs and you'll feel great! Describe and illustrate good dental hygiene. Brush your teeth gently. Don't squash the bristles - that means you're brushing too hard. Replace your toothbrush every two to three months, or as soon as the bristles are worn or bent. A worn-out toothbrush does not clean your teeth properly and can hurt your gums. You should also replace your toothbrush after you've had a cold. Be sure you are reaching every tooth. The toothbrush can only clean one or two teeth at a time, so move it around a lot. Avoid toothbrushes with hard bristles, which can damage your gums. Use a toothbrush with soft, end-rounded bristles. By the time you're four, you can floss your own teeth. Try using a loop of floss. Tie the ends of a 10-inch piece of floss, forming a circle. Hold the floss tightly between the thumbs and forefingers. Floss your teeth the same way each time, so that you don't miss any teeth. Floss gently, so you don't hurt your gums. Name three things that may harm your health. - President’s Challenge. Instructions and tips for earning the President's Challenge Award honor can be found in the Awards for all Levels section. 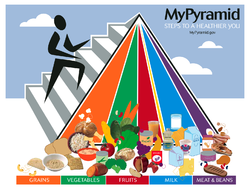 mypyramidtracker.gov Food Pyramid Official Site.